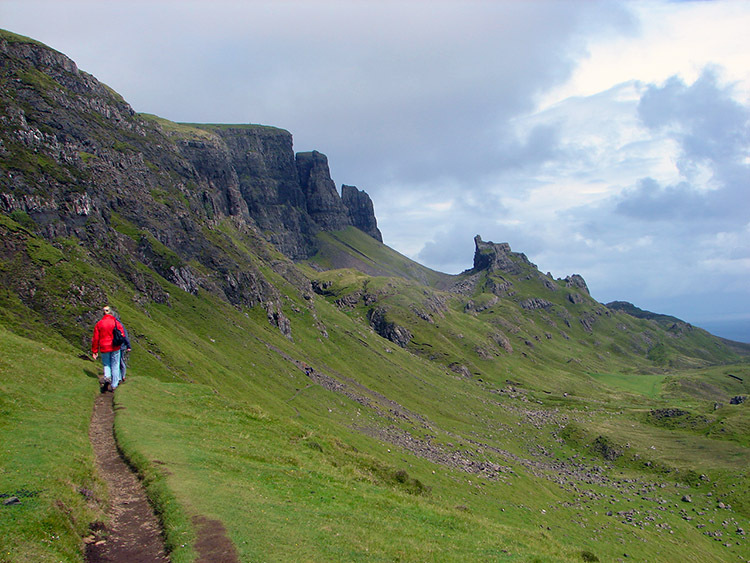 Summary: The Quiraing was the walk above any other that I wanted to do in Scotland as soon as I had read about the tremendous crags and pinnacles in the area. Features named The Prison, The Needle and The Table captivated me so much that I just had to walk them. This is not the longest walk ever done but for sheer beauty and challenging climbs it was one of the most memorable. 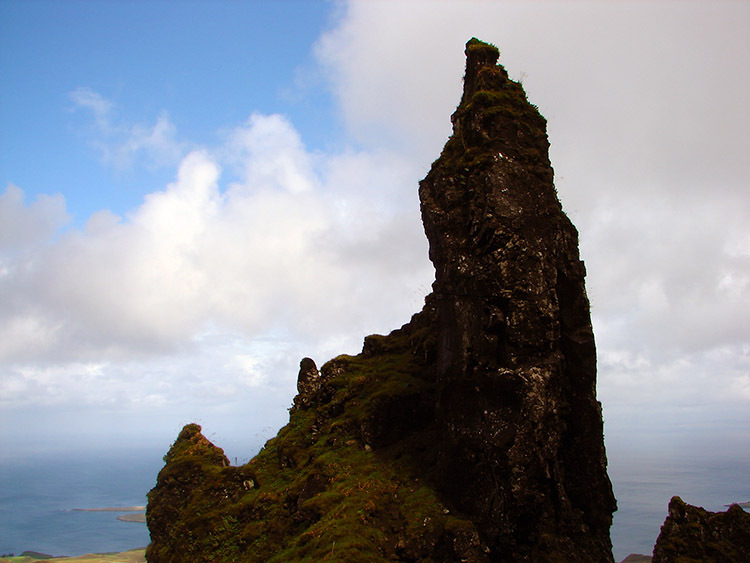 The Isle of Skye has always had the phrase 'magical isle' attributed to it. 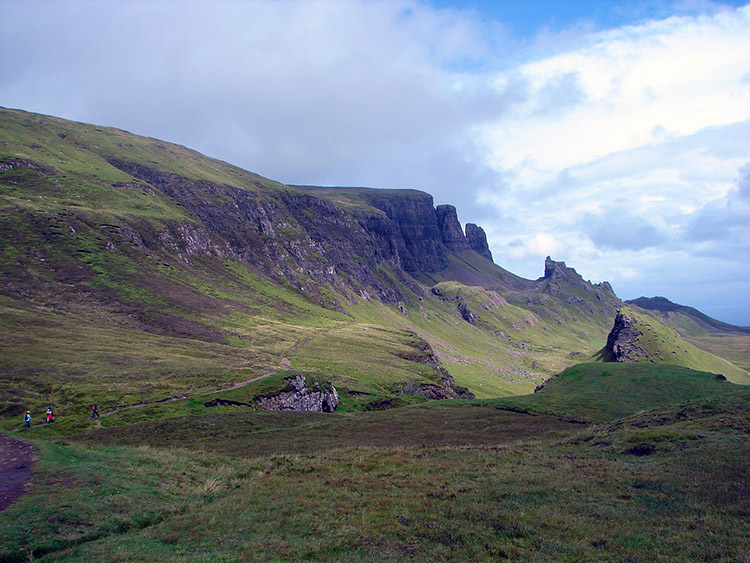 Many walkers have passed messages to me saying I must visit and for so long not only the Isle of Skye but the whole of Scotland had been avoided by me. 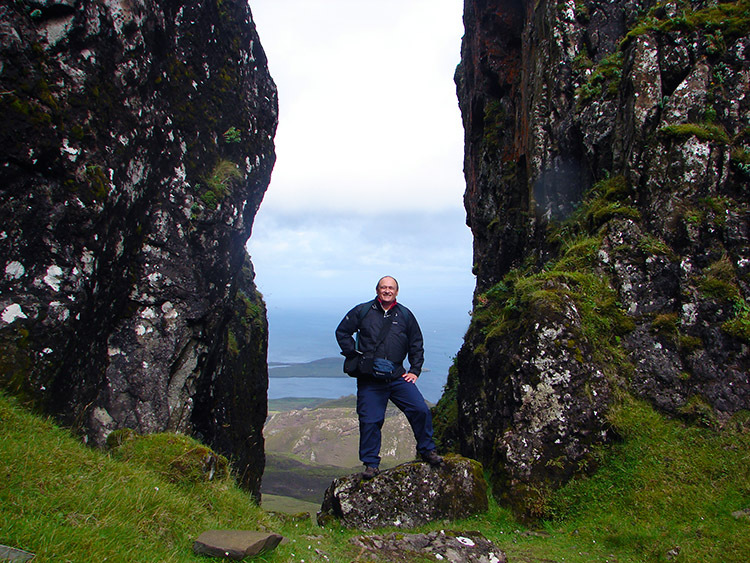 Not intentionally I must add but 2008 was the year for putting all that right and the first walk on my list, certainly the most important was the Quiraing. 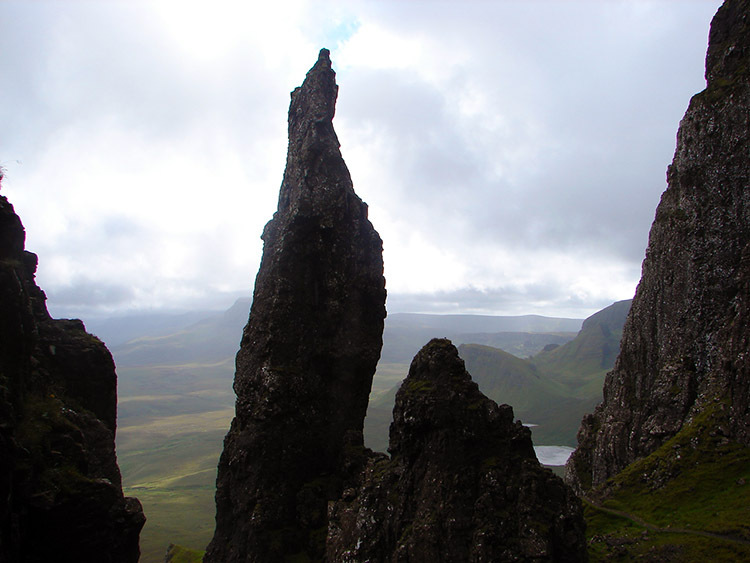 After three days in Scotland in which my wife Lil and I had travelled first to Ayr (via a Dumfrieshire walk) and then to Nairn and Inverness we briskly made our way onto the Isle of Skye. A little trepidation was in my thoughts as we travelled over the bridge at Kyle of Lochalsh as the weather forecast for the next few days was not good. Indeed it rained as we crossed onto the isle. But things were quickly about to get better. Lil was driving as we made our way to the Rosedale Hotel on Portree and as we did so the clouds lifted, the rain stopped and the sun came out. "Let's do the Quiraing now" I said to Lil and to her credit she immediately agreed knowing how much the walk meant to me. 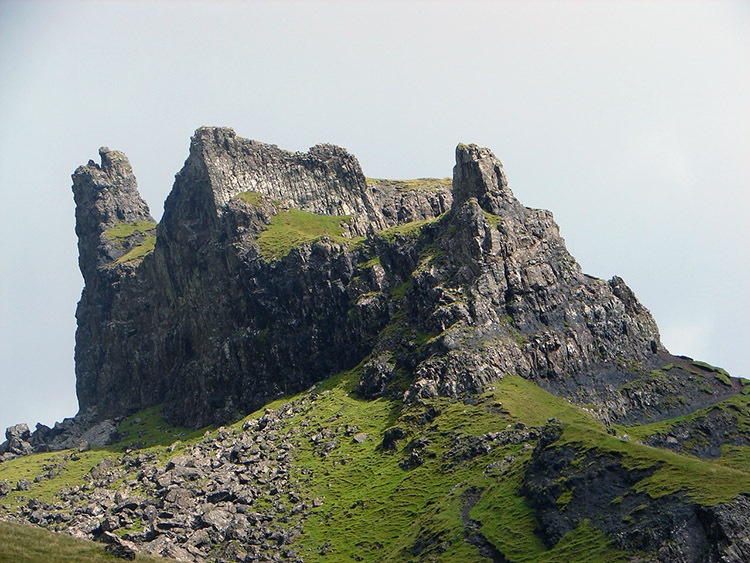 And so we past straight through Portree and along the A855 to Staffin, past the Old Man of Storr and on to the car parks near the Quiraing. We quickly changed into our walking gear as the sun beat down on us. We were so lucky, it was beautiful weather here and yet it was raining over the rest of the UK. 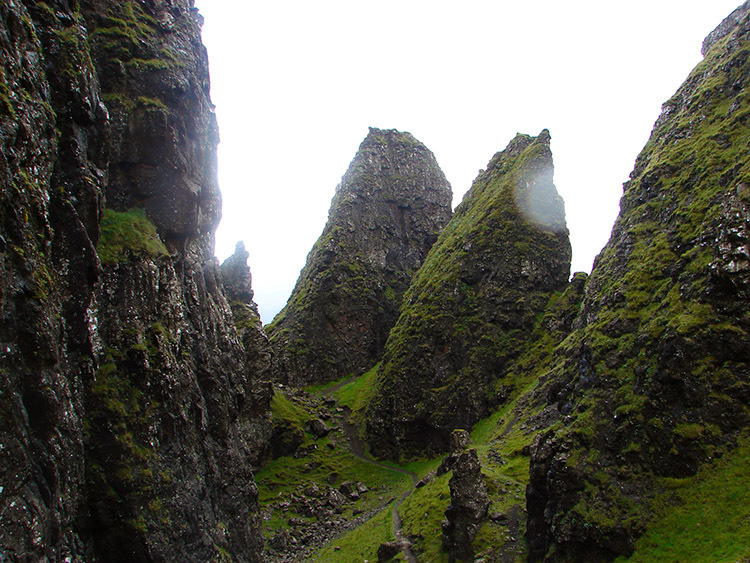 As soon as we were walked my eyes were fixed on the view ahead for the Quiraing is a unique place. It was formed at the end of the ice age when a bed of solidified lava about 300m thick broke away and began to slip into the sea and thus creating the weird landscape. And it was beckoning us to explore it. The first named feature of the walk we came across was the Prison, an enormous sheer sided slab of volcanic rock. 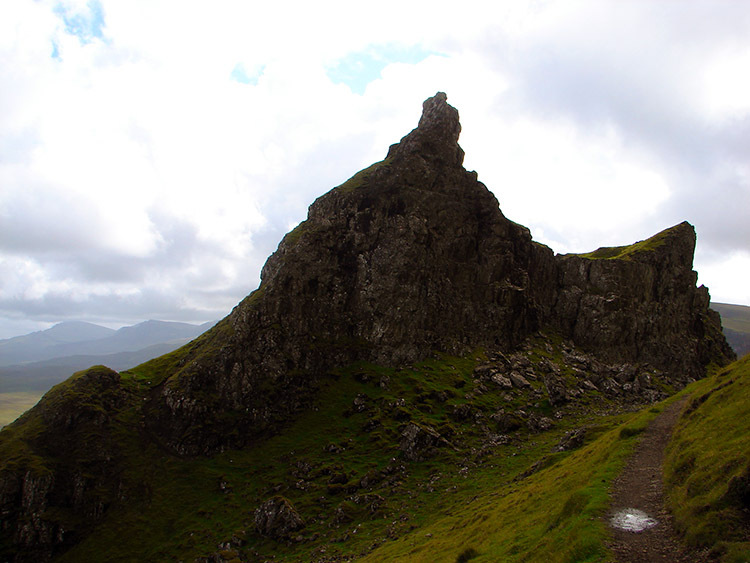 It asked to be challenged as some other walkers were doing but instead I was forced to my left to follow Lil who had already made the bold decision to scamper steeply up to the adjacent feature on the left, the Needle, an erect tapered rock that defied erosion. I was pleased Lil had set off without encouragement but now I had to follow and all credit to her, I did not find it easy. However we steadily made our way up to the base of the Needle and around to shelter from the breeze. We stopped for a while in the strange amphitheater created by the surrounding rock pinnacles and enjoyed a drink while taking in the fantastic views. 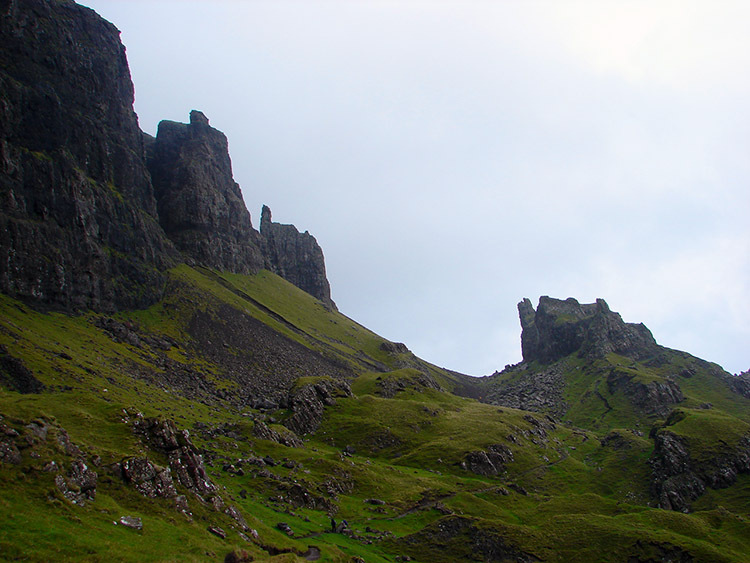 We both agreed the effort of driving across the island to Trotternish in order to explore the Quiraing was worth it. 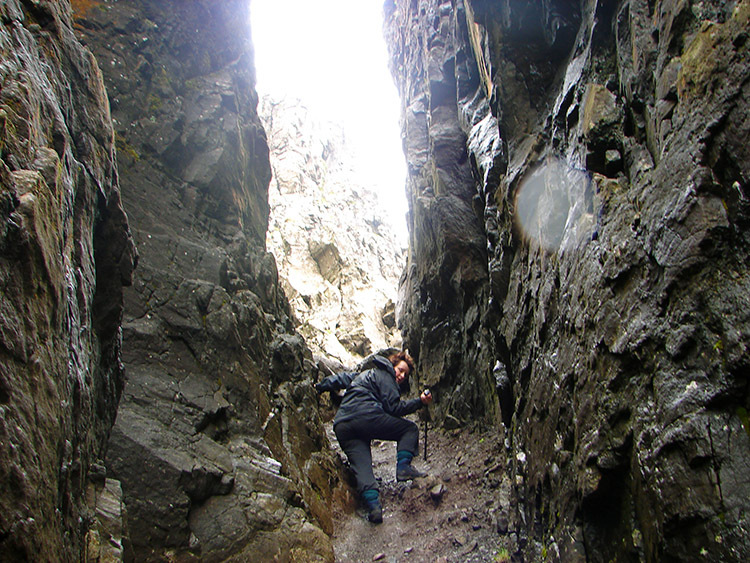 Even the careful stepping over loose boulders to get closer to some of the strange formations was fun. And yet more excitement was to follow as the next section of the walk was brilliant and fun at the same time. 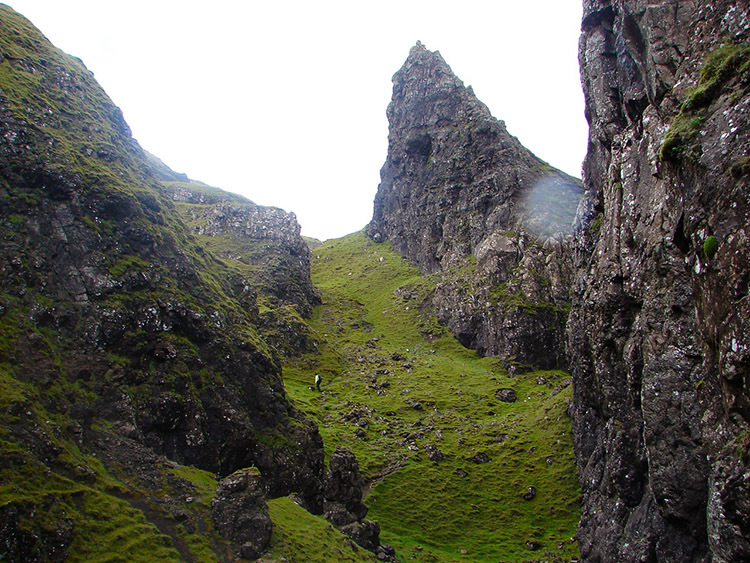 Between the Needle and the other dominating feature of the Quiraing, the Table we walked amongst the most enthralling rock features and every now and again we came across a gap that afforded superb views to the north and east. From such vantage points we could view quiet Staffin Island just off the shoreline and also lochs Torridon and Gairloch on the west coast mainland of Scotland. We were so lucky with the weather and the views were immense. We could have scurried on the higher ground for ages but eventually we had to leave and thus took a path down to rejoin the low level just above Loch Fada. From the low path we tracked south back to the Table and then back along the same path we had come from to the car. On the way back Lil mentioned how this had been one of the best walks she had ever been on because, in her words "It was always interesting, I really enjoyed it". It was about the right length for her to walk and the only reservation I had was that she would cry off at the climbs. 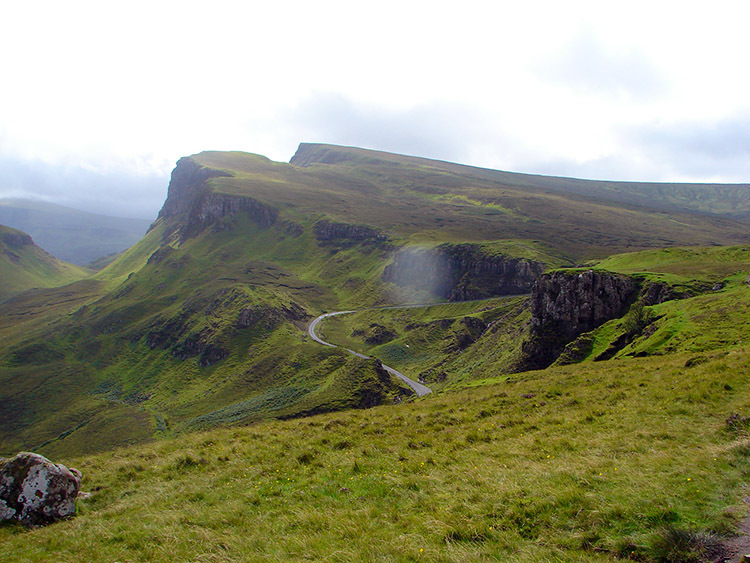 How wrong I was and how pleasing that she enjoyed the Quiraing as much as I did. And I certainly did enjoy this fantastic walk.